You may forget that you are in Japan, when you see the high-lights along the Bandai Azuma Skyline and the dynamic view of Jyodo-daira. It is worth going up the hill to see this beautiful scenery. 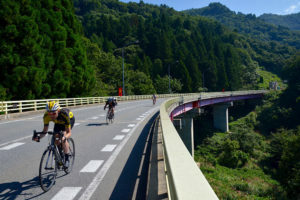 The south entrance to the Tohoku area, located in southwestern Fukushima is an area which is rich in the characteristics of Ai-zu history and culture and also full of mountains and beautiful water areas. Aizu (especially Minami Aizu) is in a heavy snowfall area, sometimes with more than 3 meters of snow during winter. 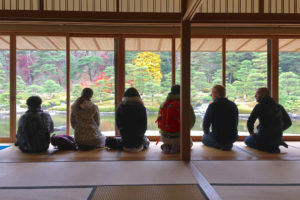 You may feel nostalgic even when you visit there for the first time, because the same lifestyle and culture has remained for generations in the Aizu and Shirakawa area. The area is surrounded by mountains, but the roads running along the stream in the villages are relatively gentle and the surface of the roads is good, therefore they are easy to ride on. 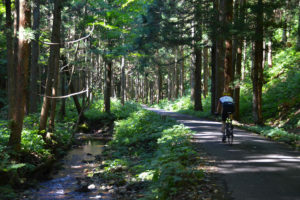 You can feel the mystery of nature in the Bandai Azuma Skyline and the beech tree forest in Tadami, where the superb view continues onwards like you are in paradise. You can also experience the majestic and graceful Tsuruga castle, as well as Ouchi Jyuku, which has the remains of old-style houses with thatched roofs and watch Hinoemata Kabuki, which has been kept going by the local villagers since the Edo Period. 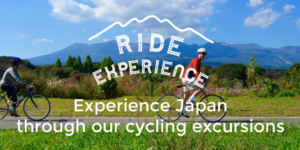 You can take your bicycle aboard the train between Aizu Tajima Station and Nishi Wakamatsu Station on the local Aizu Line throughout the year (except during Golden week, the Obon holi-days, the autumn season and the New Year holidays). If you are hungry, why not have some local specialty food such as Nango Tomato, Soba, Shirakawa Ramen and so on. After-wards, unwind at the Onsen, which has an abundance of hot spring water. A good way to access Shirakawa from Tokyo is by Shinkansen on the JR Tohoku Shinkansen Line, which stops at Shin Shi-rakawa Station and also runs along the Tohoku Expressway. Taking the rail line that heads towards Aizu Wakamatsu, you can take the Banetsu Nishi Line from Koriyama Station to Aizu Wakamatsu Station. The other way is using the Aizu Railway, which connects the Tobu Railway and Yagan Railway from Asakusa and Kinugawa. If you use a car, it is more convenient to take the Tohoku Ex-pressway and Banetsu Expressway. 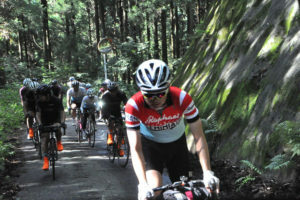 You can enjoy the atmospheric Japanese countryside only by bike. 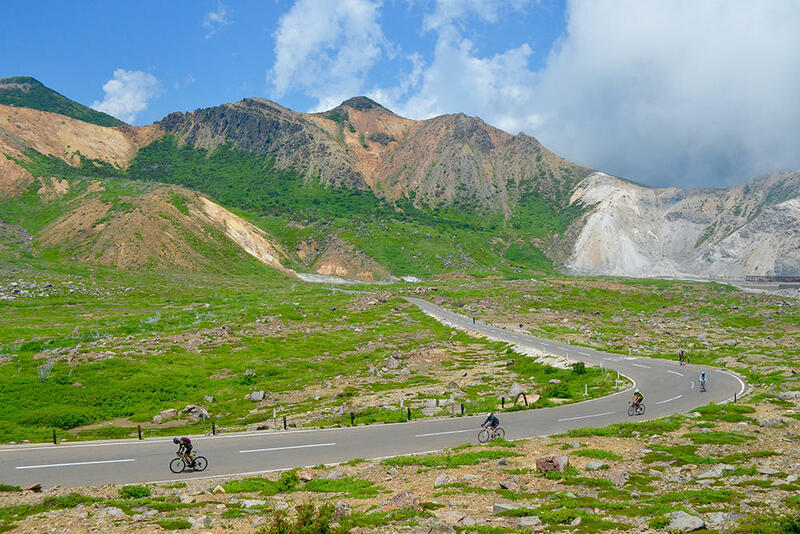 This is a rich route where you can experience beautiful na-ture, deep history and peaceful “Satoyama” (cultivated land close to the sides of mountains). The majestic and graceful Tsuruga castle is a symbol of Aizu which is loved throughout area. Oouchi-Juku once flourished as a post station on the Aizu Nishi Road from Nikko to Aizu. It has a special landscape where there are thatched roof houses on both sides of road. Why don’t you have “Negi-soba” (Spring Onion Soba) for lunch, where you eat it with spring onions for chopsticks! Shirakawa no Seki was the entrance of the Tohoku area during ancient times. It is now surrounded by 800 years old cedar trees and it has a solemn and peaceful atmosphere. This is a “Photogenic” picture of a local rail line. The “Daiichi Tadami Gawa Kyouryou” (No. 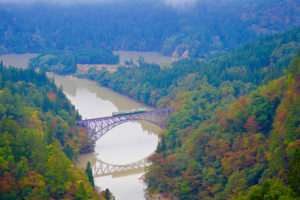 1 Tadami River Bridge) viewpoint is a place where you can take a photo of the iron bridge over the Tadami River, which flows through the mountains. The Tadami Line goes over the bridge. “Hinoemata Kabuki” (Farmers’ Kabuki, Kabuki being a form of Japanese theatre) has lasted since the Edo period. 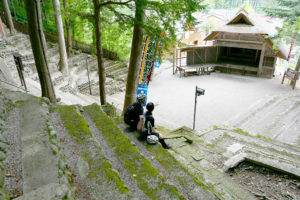 If you sit on the stone steps that surround the thatched roof stage, you can feel the passion that has been passed down from each genera-tion in the village through the ages. Farmer’s Kabuki is per-formed four times a year: April, May, August and September. You can take your bicycle aboard the train between Nishi Aizu Station and Aizu Tajima Station on the Aizu Line throughout the year (except during Golden week, the Obon holidays and in the autumn season). Then you can view the nice scenery of Aizu from the train with your bike.